The filter should be used as a standard at all imaging applications with sensors having a low sensitivity in the UV, e.g. Webcam, DSI and LPI from Meade or most video systems. 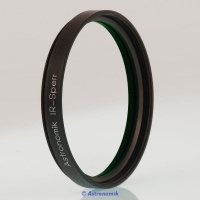 Ideal filters for the reception of the moon and planets, notably Mars, with telescopes from 6" (150mm) aperture. The ProPlanet IR 742 only allows infrared light with wavelengths of more than 742 nm to pass. Ideal addition to the Astronomik ProPlanet IR 742 for imaging the moon and planets, with telescopes larger then 10" (250mm) when the seeing is poor. 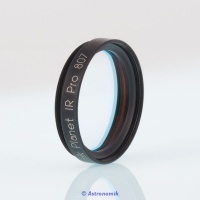 This filter is an ideal complement to the ProPlanet IR 742 for use with converted DSLR cameras, CCD cameras and Webcams. Astronomik IR Block Filter 2"
The Astronomik UV-IR Blocker is the ideal choice as a luminance filter for any kind of digital photography. Now available in the popular Canon EOS Clip Fit. The Astronomik H-beta is a filter for visual observation, in particular with instruments of larger aperture. Available in 1.25" and 2" fits.